This is a partial shot of my backyard (another work in progress). The trees are newly planted bare root fruit trees from Wilco. The green stakes are bamboo harvested from my parents’ yard. 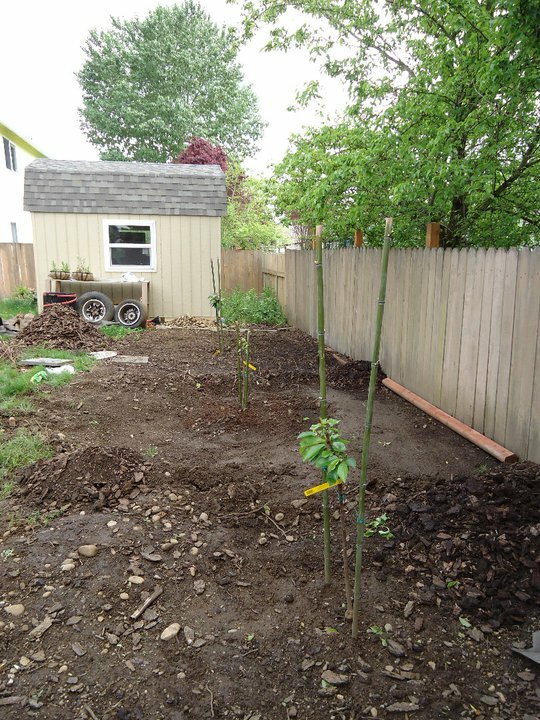 All three are dwarf, sweet cherry trees. From left to right they are a Bing Cherry, Black Tartarian Cherry, and a Stella Cherry. The cool thing is these trees can all cross-pollinate each other. Dwarf trees are great for small backyards as they only grow about 8-10 ft tall and wide. They should produce fruit in 2 years. I wanted to get these in the ground asap due to the amount of time it takes to see a return on the investment. Next Recycled Cans Are Paying For These Projects!